The vulnerability of our umbilical link to the South African Rand has resurfaced painfully over the last month as the latter took a not-insignificant beating in currency markets. Five years ago, around the middle of 2013, one American Dollar equalled R9.58. Earlier this week, the Rand tested the R15.60 levels, hovering in uncertain trade between R15.25 and R15.55. Roughly, the Rand’s recent performance constitutes a 50% decline in a mere 5 years. So it was not surprising that several currency traders this week started warning South African companies they have to brace for a R18.00 exchange rate. 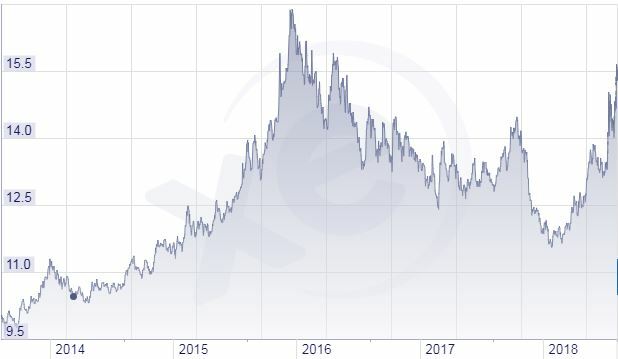 Looking at historic performance I noticed that four years, ago the Rand still showed some semblance of an international currency, holding fairly steady between R9.55 and R9.95 for the first semester of 2014. Later that year, the first weakness became apparent and it was downhill all the way with a precipitous decline. From the end of 2014 to January 2016, the Rand continued its freefall, eventually reaching R16.88 on 18 January 2016. It does not require special insight to match this dismal performance to the wackiest years in the Zuma saga. Every time the former South African president washed his mouth, the Rand took another tumble. This was most evident in the first two weeks of December 2015 when it lost around 30% in less than half a month. Then, during 2016, South African civil society started targetting Zuma and his criminal friends. The campaign that eventually rid the entire southern Africa of this cancer ran from early 2016 until early this year when the water finally became too hot for the conniving leader. This history so closely match the Rand’s external value, it almost seems as if the trading script took its cue from the political scene, which I suppose, it did. The correlation is uncanny. 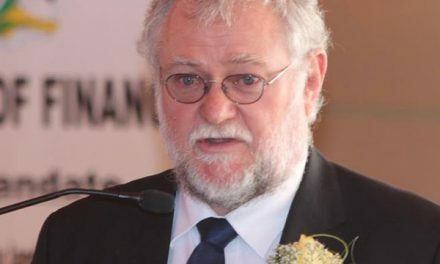 Throughout the period of civil defence against the marauding head of state, the Rand followed in step, again clearly reflected in the trading charts as the currency was trying hard to make a come-back. On 15 February 2018, Cyril Ramaphosa became South Africa’s replacement president, and what do you know, a week later the Rand registered its strongest value of R11.55 to one US$ on 24 February. Unfortunately for us, that honeymoon quickly evaporated bringing us to this week where our unbeloved proxy currency was fast heading again for the stratosphere. Why is it so important to us what happens with South Africa’s currency? For Namibians, the answer is obvious, we live with it every day. For people unfamiliar with southern Africa, it is not so straightforward. Our currency, the Namibia Dollar, is tied on par value to the Rand. The latter is even legal tender in Namibia, meaning that at any time, in any and all industries, there is always a significant amount of Rand floating around. We are tied to it as tight as your skin is attached to your body. The consequence is that whatever happens in South Africa, happens here too because it is immediately imported via the currency link. It does not take a week or a month or a semester to take effect, it is immediate. And where we see it most clearly is the price we pay for our fuel. Now, despite whatever clueless politicians may claim, we do not produce our own fuel, not a single drop. Everything is imported, and most of the time through South Africa. They also do not produce very much of their own fuel, only a small percentage, meaning they also have to import fuel. Actually, I believe South Africa imports roughly 80% of the region’s overall fuel requirements because a very substantial part of the fuel for us, Botswana, Zambia an Zimbabwe, comes through the giant in the South. Even Mozambique gets some of its fuel from South African refineries. So we are all extremely exposed to the vagaries of the Rand, and fuel happens to be that crucial commodity where we see the impact the quickest, and the most debilitating. What happens to the Rand, happens to all of us, and that means many millions of people living in southern Africa outside South Africa. Our link to the Rand is a favourite topic among daydreamers, other visionaries and students. These categories on the fringe are the only place where the link is ever questioned. Mainstream financial services accept the inevitability of being linked to another country’s currency, and to its political clowns. They readily tell you that there is nothing we can do about it. Enter the International Monetary Fund’s Special Drawing Rights, or SDR. For all practical purposes, SDRs are gradually becoming an international currency standard, even if only on paper. Botswana has experimented a little with the SDR concept, using it as the other half of the basket that determines the external value of their Pula, but the first half of that basket is still Rand. I believe we have come to that point where our link to the Rand requires serious debate. I am not proposing that we sever that link overnight – our economy is currently simply too weak – but I think we have to start with the work that will eventually put a viable currency alternative before us. There are many currency developments in the regional arena but from what I see, these mostly tend to favour Rand transactions and we are trying, or wishing, to come away from that. I do not have a clear strategy, only a clear goal: We need to wean ourselves from the devastating exposure we have to the Rand. There are several options out there, we only need to make up our minds which one is best for us, both for our exports and our imports. Put simply, our currency value must be determined by economic fundamentals and not by what another government does or fails to do. Currency chart courtesy of xe.com – Ed.